This looks like it has potential. If it survives, it can wrath all the mentor or pyromancer tokens. It also dodges bolt. I was about to post this as well. So to start with, this is a blue Tarmogoyf. Tarmogoyf in the best case is a four-turn clock; if it takes two turns to flip this thing, it is also a four-turn clock (because it can attack the turn you flip it). When it does flip, as you say it bounces your opponent's token swarms, Golems, etc (everything except Phyrexian Revoker, I guess). Tarmogoyf hasn't seen much Vintage play in a while, but this feels like an upgrade and worth consideration. This card is real promising I think. The Tarmogoyf comparison is apt, but I think it's important to remember that Tarmogoyf is smaller in vintage than it is in other formats, and probably would have seen a lot more play if it cost 1U instead of 1G. There's a lot of places you can reasonably slot this card into. I also think you shouldn't overlook the 0/4 starting body - I think that could be very relevant in some of the decks you could put this in. I find it totally playable. We have been talking here that the age of vertical grow has been replaced by horizontal grow (pyromancers and mentors created this change). However this is a 7/8 for 1U, not reliant on graveyard (but can be resetted if bounced). While it can be chumpblocked, since it creates a wrath effect when transforming it's cleaning space. Notice that 7/8 is perfect fighting against griselbrand, which is really nice. I cannot say broken, but those decks with preordains and probes could try it as a finisher. Not just that, but this dork doesn't auto-lose to chump blockers (due to the bounce effect) or removal when it's small (it's trivial to recast and reflip). I think he takes the crown from Mana Gorger Hydra as the best vertical grower -- maybe even good enough for Delver to play! What I don't get is why Wizards decided Blue needs to be the color of undercosted monsters with easy-to-satisfy conditions. (Delver, Ensoul, this thing). I mean, I GET IT, you want me to make my Cube all-blue, OKAY. I'm really surprised at how powerful this card seems at first glance. Even if it transformed into a 4/4 or something, it would be pretty darn good. Where the heck did 7/8 come from? This card definitely seems like it'd have a place somewhere in Vintage; I'd be really surprised if people didn't at least try it out. With that said, what's with the names of these new cards? Thing In The Ice? Brain In A Jar? Clip Wings? Shard of Broken Glass? Shamble Back? I'm not a fan. What I don't get is why Wizards decided Blue needs to be the color of undercosted monsters with easy-to-satisfy conditions. (Delver, Ensoul, this thing). I agree. This effect would've been interesting and obviously more diverse if it were in red or green. I like this card a lot - acts as a good early-game wall and then a conditional evacuation plus a big finisher once you play enough spells. Def warrants some testing. Very good card on paper. Kills tokens, 0/4 is good against Shops, uncounterable instant speed bounce against Dredge and oath. It's blue so on color for almost everything. However, there are some limitations. Swords is a straight 1 for 1, and bounce spells can slow it down dramatically as win con. It doesn't play nice with your own mentors/Pyromancers. Notable cards it does not bounce: Ichorid, Flipped Delver, and Revoker. Notable cards it does not bounce: Ichorid, Flipped Delver, and Revoker. Well, now Delver can go the MonoU route and pack Energy Flux and Back to Basics if it wants. Or, on another note: MonoU can play the tempo beating as a complementar strategy. Ah my confusion with the new one that turns it into a horror. I think that makes it worse. You can't really play this along side any of the other common creatures in Vintage right now. Snapcaster is the only one off the top of my head that plays nice. Trinket can also be bounced without much pain. If playing monoblue, the forgotten spellstutter sprite also deserved some merit in the past. And tbh, you are only bouncing creatures if it transforms, so if your delver returns to your hand it's because you have a new flamboyant 7/8 in play. 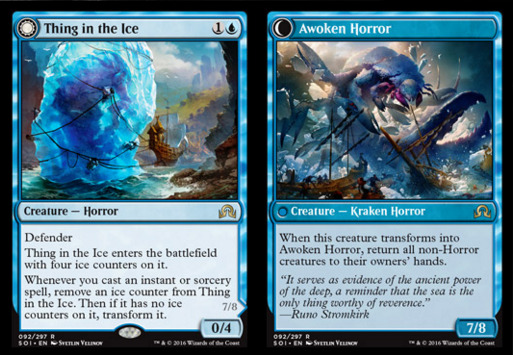 One question: if I play shadow rift on a thing in the ice and it transforms into awoken horror, does it still have shadow or not? Technically it's the same creature, it's not like exiting battlefield and returning. 711.7. When a double-faced permanent transforms, it doesn't become a new object. Any effects that applied to that permanent will continue to apply to it after it transforms. It's slightly annoying that it can't bounce Revoker, but otherwise seems quite good. I think this will see some solid play. Seems powerful. If it didn't have the bounce effect, it would still be good. This is better than goyf. Doesn't need the yard and can pitch to fow. Survives a bolt immediately. All that said, Monastery Mentor is a better finisher. Much more difficult to stop than this horror. 1. Cutting red means cutting some pretty great cards. 2. This card has a much longer time-till-threatening than Young Pyromancer. Even in Vintage, you're not likely to flip this thing for at least a full turn, more likely two. 3. This card does nothing good for you for those first 3 spells. At least Pyromancer is making threats/blockers. 4. Young Pyromancer effectively blocks multiple things. Until you flip Thing In The Ice, you're having a real rough time against other grow decks, especially big monks coming at you from Mentor. 5. You're going to be super sad if they bounce or kill this guy before you manage to flip him, especially if they do it with Swords to Plowshares. I'd be interested in trying this as a sideboard card against Oath and Dredge. Rather than stopping them from doing their thing, let them do it, then bounce all their dudes. That may be too slow, though. The gaming with this will be really fun. For example, if you have this guy at 3 counters against Oath, do they just choose not to oath? Similarly, do you play any more instants/sorceries or do you hold them so that you can flip this guy and bounce their oath target. That question gets even more fun against grow. How many elementals do you make before you stop casting cantrips to save them for post-flip? This is better than goyf. 1. Goyf is a better topdeck if your hand is empty and you're drawing your way out of a problem. 2. Goyf is also better if your 2 drop beatstick gets bounced or blinked. Granted, the work to re-flip Thing in the Ice is minimal, it's still work Goyf doesn't have to do. I agree that in basically all other situations piloting a deck with lots of U cantrips and countermagic, I'd rather have Thing. Different than Delver and Young Peezy in one critical aspect. Flipped Delver and Peezy with a single token can trade with Lodestone and buy you some time. If you follow modern closely, the color blue is a long standing joke save the late twin. The popular consensus is "there's no reason to play blue aside from snaps." As far as vintage is concerned this card is insane. Mostly trivial to flip, good in multiples, has a relevant ability, costs 2, is blue. The problem this has against Goyf is that it's worst late game. At that point, Goyf enters play a 5/6 (or something like it). With this you still have to flip it. Topdecking this in a topdeck war is way worse than Goyf, Delver or Pyromancer. Don't really see how this is tarmogoyf at all. This needs a deck heavy in instants/sorceries, is much more vulnerable to bounce spells, and much less reliably an attacker. The closest comparison of cards in terms of effect is Crush of Tentacles. That card is relatively new though, and no one has really played it yet either. If this card started as an 0/6, I'd be on board. As is, I think the cost of triggering it is too steep to make it playable and an 0/4 can't block enough stuff in the format. Being a body of 4 o more (not dying to Lightning Bolt) makes it really interesting. It can also block bears all day long. Also, the cost of triggering is really small in a format where you can transform it "almost" whenever you want if your deck is suited to do so. But landing it quite before an EOT battle is really nice to bash on your turn. Walk is a menace once your threaten to kill in 2 blows without blockers. I like it. Very much in indeed. This card is obviouly unplayably bad in Vintage and shouldn't be getting any attention at all on this site. Why is nobody else in this thread saying this yet? Are people just getting caught up in the set's hype and forgettIng to be skeptical? I find this discussion baffling. I'm all for enjoying new sets, but very few new cards are good enough for the format, and I just don't see this making the cut. "New Vintage cards" is a contradiction in terms, after all. Do I really need to state the obvious? This card is plainly too slow and not nearly as good as the other established creature options. I'm glad people feel confidant taking strong positions. Me? I don't think that 1U for a board wipe and a 7/8 is "obviously" unplayable in Vintage, just like I don't think a card that needs four other spells to do anything is "obviously" playable. I wouldn't mind playing with a set of TITIs. Still, until we get them in our hands, it's hard to know how good they really are. I'm inclined to agree that it's likely unplayable, but given that there's not much else to talk about, what's the harm in digging a little deeper? I picked up a playset of these bad boys right away. People aren't fully acknowledging how amazing the bounce ability of this guy is. Not only does he bounce Pyromancers, Mentors and all their annoying friends, but he also bounces hatebear armies as well as all lodestone golems in play. ANNNNDDD then he swings for 7 right away to boot. I suspect there will be a couple decks that break the crap out of this guy. Well, that's your opinion. People are not saying this card is broken but playable, and I'm among those people. Very few cards are directly identified as totally playable (as long as I remember, cards as delver, jace, snapcaster or even lodestone golem were identified as not good enough by lots of people), and every spoiler season some members including me talk about some interesting cards, most of which will have 0 success in vintage. This forum is to talk about vintage, and that includes discussing, share thoughts and specially learn from the rest of members. You are inclined to think that this card is slow and worse than other options, and that's a respectable point of view. Just don't get mad if other people try to get something from this thing (pun intended). I posted before you that I didn't think it was good enough. 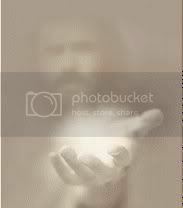 Casting 4 instant/sorcery spells is a HUGE cost. However, I do like this card vs Dredge a lot. I just don't see it being good vs much else. Vs Shops it looks good, but casting those 4 spells is gonna be tougher than it sounds. Vs. other blue creature lists (delver, pyromancer, mentor) they should be able to reasonably anwser this card before it flips. Or they could take a line that when it flips its just a 7/8 and bounce it with Jace. They could also force the flip, then bounce with Jace. The fact that you cannot control if you want it to flip or not is a HUGE drawback. A blue mirror could force the issue with a cheap spell that demands a counter, then bounce with Jace. Reset, here is your 0/4 crappy wall again, enjoy. The upside on the card could be huge, but the downside is that's its an 0/4 wall that does absolutely nothing when drawn late. Outside of being in a opening hand, the lines you have to take to get this online are going to be convoluted and not intuitive. That much different than Delver of Secrets, because when draw late, it only takes up 1 mana and can flip relatively quickly. I would almost always prefer to have a pyromancer with 4 1/1s in play than a flipped one of these ever. And at least pyromancer is scalable and isn't inclusive, and leaves something behind if it leaves the battlefield. Also, if you are casting 4 instant/sorcery spells in a game, aren't you already winning that game? So it's an 0/4 wall 80% of the time, and win more 20% of the time. No thanks, I don't find that playable.